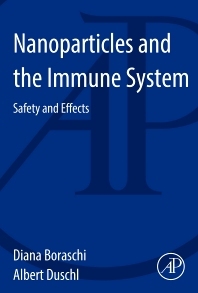 Nanoparticles and the Immune System provides a reference text for toxicologists, materials scientists and regulators and covers the key issues of interaction of nanomaterials with the immune system. The book discusses several issues that toxicologists and regulators need to know: identification of endpoints that are relevant for assessing hazard, evaluating impact on immunologically frail populations, and how to evaluate chronic/cumulative effects. In addition, the book addresses the possibility of turning the immunomodulating properties of certain nanomaterials to our advantage for amplifying immune responses in certain diseases or preventive strategies (e.g. vaccination). 3.6 Toxicity at the Level of Specific Immune Cell Types: Does it Exist? 5.1 When Does Immunological Frailty Occur? Diana Boraschi is an immunologist that built her experience both in academic institutions (Italian National Council for Nuclear Energy, Italian National Research Council, National Cancer Institute in Bethesda, MD, Mario Negri Institute in Milan, Italy, University of Michigan Medical School, Ann Arbor, MI) and industrial settings (the vaccine company Sclavo in Siena, Italy; the pharmaceutical company Dompé in L’Aquila, Italy). She is presently Research Director at the Institute of Protein Biochemistry of the Italian National Research Council in Naples. She has served as Director of Fellowships at the Human Frontier Science Program Organization in Strasbourg, France, and as external expert evaluator for the research programmes (FP5, FP6, FP7, H2020, EDCTP) of the EU Commission, the Singapore National Medical Council, and the US National Science Foundation. She is author of 156 peer-reviewed research articles in immunology, editor/author of 17 books, and inventor in eight patents, in addition to numerous monographic and divulging publications. She is particularly involved in higher education training activities and capacity building actions in Africa, in the field of poverty-related diseases and health care systems and delivery. Diana Boraschi studies the mechanisms of innate defence responses, focussing in particular on the role of macrophages and inflammatory cytokines in the effector phase of defence reactions against infections and tumours. Her main interests are the receptors of the IL-1R/TLR family and their cytokine ligands (IL-1 and IL-18). A fragment of IL-1 endowed with immunostimulatory activity is now defined as the “Boraschi loop”. She is currently studying the role of inflammation in the pathogenesis of diseases (from autoimmune syndromes to degenerative diseases such as ALS, and in ageing), with particular emphasis on abnormalities in the activation of macrophages. Within the study of the initiating mechanisms causing chronic inflammatory and autoimmune diseases, she has recently addressed the possible impact of engineered nanoparticles, and of their interaction with microbial derived factors, in initiating or modulating pathology-related inflammation. She has initiated the “Immunosafety Task Force” within the NanoSafety Cluster (an initiative sponsored by the EU Commission), a focus group aiming at defining and standardising the immunosafety assessment as central part of nanosafety regulations.